Who says the mix tape is dead? 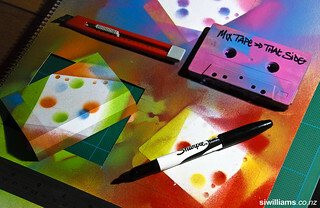 With all of the talk of this new copyright law, I got myself to thinking about mix tapes again. When I was a child, I remember visiting the record store and seeing a sticker near the checkout with a skull and cross bones and words something along the lines of – “Music piracy is against the law and is killing music”. This sticker gave me great fright and fear, my parents had mix tapes, were they going to be arrested because of them? Seriously, is making someone a mix tape really that bad?